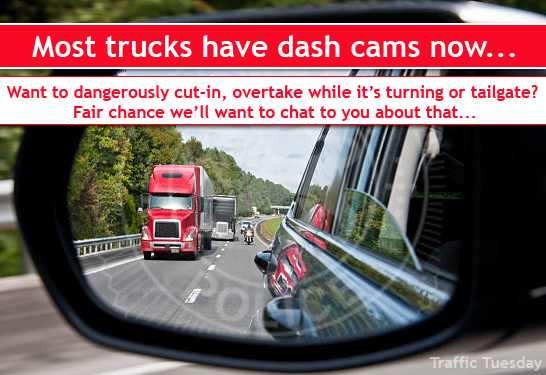 Most trucks have dash cameras now, and we are more than happy to follow up complaints, so if you drive dangerously around a truck, there’s a fair chance we’ll be calling you after the truckie calls us. Remember, if you can’t see a truck drivers side mirrors, the truck driver can’t see you! Pulling in front of a truck when there is insufficient distance for it to stop safely is dangerous – you face a fine of 3 demerit points and $159 – but worse you risk seriousl injuring or killing yourself or someone else. Before overtaking a truck, make sure there is enough time and space so you can overtake them without cutting them off – remember to never overtake a turning truck. Increase your following distance when driving behind a large truck so that you can see the truck’s side mirrors – remember, a truck driver’s rear and side views can be poor with large blind spots. This page -- https://www.police.tas.gov.au/what-we-do/traffic-policing/traffic-tuesday/26-truck-safety/ -- was last published on September 25, 2017 by the Department of Police, Fire and Emergency Management.